Well Christmas is over and somehow I still have more projects going than I know what to do with! 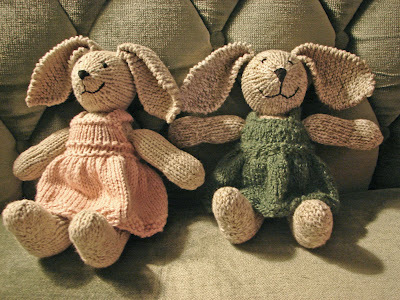 Looking forward to spring, I'm knitting up as many bunnies as I can. Only two so far, but they're adorable. I've also been working on more pattern writing. I developed a lovely pattern for a chick, which I have been able to make one of. I'm impatiently waiting for more yarn that should be here within the next couple of days. 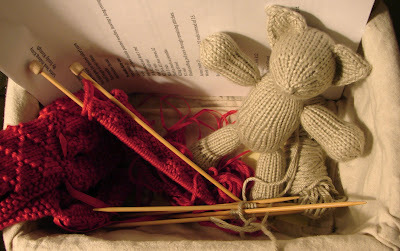 Once it arrives, I will be able to make more little chicks as well as finish some more little red riding kitties. I'm still working out the kinks in that pattern and hope to have it on ravelry soon. For quite some time now I've been saving all my bits of yarn and fabric to use as stuffing. I recently started my first project using them. They make a wonderful rag doll. I love how this one is turning out! The recycled scrap stuffing makes it heavier than fiberfill stuffing. 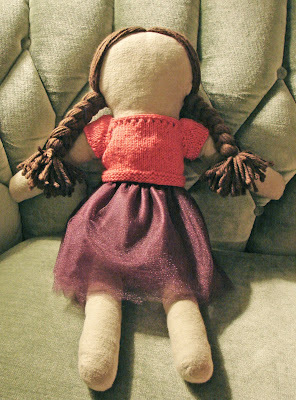 All that's left now is sewing on the eyes, and mouth and possibly some ballet slippers. Since the hobby horse was a hit, I'm working on making more of those. My knit football continues to be my most popular item and I've whipped up a couple of those in the last weeks as well. And my to do list keeps growing! There are so many things I want to work on and not nearly enough time!